Consistency of definitions - Companies with multiple plants in various regions may have different accounting systems and different definitions for the same line item. TABS develops consistent data definitions based on discussions with each plant. Each plant receives a copy of these agreed upon definitions to ensure consistent data input. 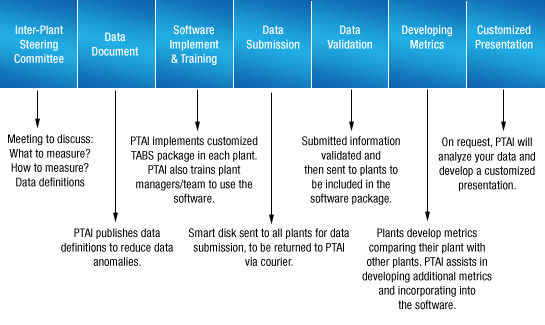 Accuracy and Consistency of data collected - Even if a company comes up with detailed definitions, there is no guarantee that the plants will understand the definitions correctly or that correct information will be submitted. TABS® conducts discussion sessions with all data owners to ensure that their data definitions are understood correctly. This data is also validated by communicating with each plant for "apples-to-apples" comparison. Data Management and Metrics Development - A database needs to be designed to maintain multiple-year, multiple-plant data and should calculate various metrics and to develop graphs. TABS® has been developed for maximum user ease of data maintenance and metrics development. Phillip Townsend Associates's proprietary software also has the capability to develop various statistical variables, trend charts and gap and other analysis. Data Analysis - The results of any benchmarking study have to be analyzed in a meaningful way once data is validated from all the sites. In many cases, the effect of scale, technology and location complicate the analysis and lead to false conclusions. TABS® conducts an in-depth analysis to identify the root causes of inconsistent data. We then prepare and present a management presentation packed full of important information and analyses drawn from your study. Time & Effort - Significant time and effort are required to implement a benchmarking program. These challenges need to be conquered to ensure accurate benchmarking results. TABS® delivers accurate results for your strategic purposes. Adopting TABS will decrease the time and effort that you spend on your program by over 70 percent. TABS® software is specifically designed to assist organizations in maintaining and analyzing multiple plant data. The software has a user-friendly interface with the capability of performing various statistical calculations and easy data upload and download feature. TABS® is implemented on the company server to provide real time data and easy access to approved users. Its multi-layered security enables organizations to provide "complete" or "partial" access to users on the TABS® database. Users can easily upload data from Excel to the the database. The validation feature checks input data against defined filters to ensure validity. Calculate desired metrics, which are easily downloaded to Excel.